Upstox Pro web is a browser-based application by Upstox (previously RKSV) that does not require any downloads or installs. Since it’s a responsive application, a user can directly access trading through a laptop, desktop, mobile or tablet and the screen adapts itself accordingly. The discount broker offers other trading applications such as Upstox Pro Mobile, Nest Trader etc. As far as Upstox Pro Web is concerned, the software has done a reasonable job till now with a room to improve in its propositions. 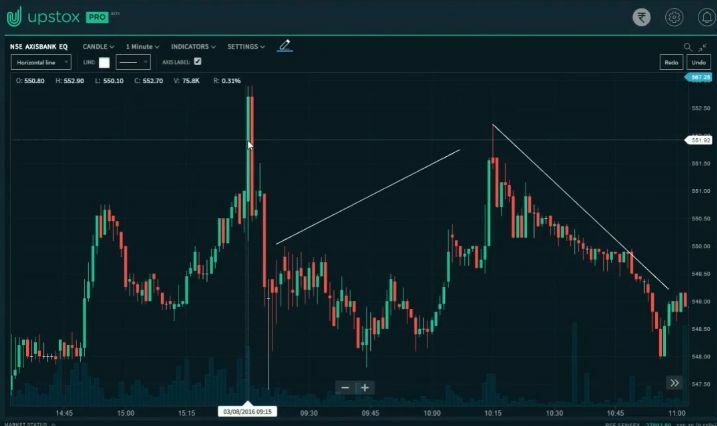 Let’s discuss at length about this application, the features it offers, the benefits you get while it for your trading needs and the challenges you may face as well. 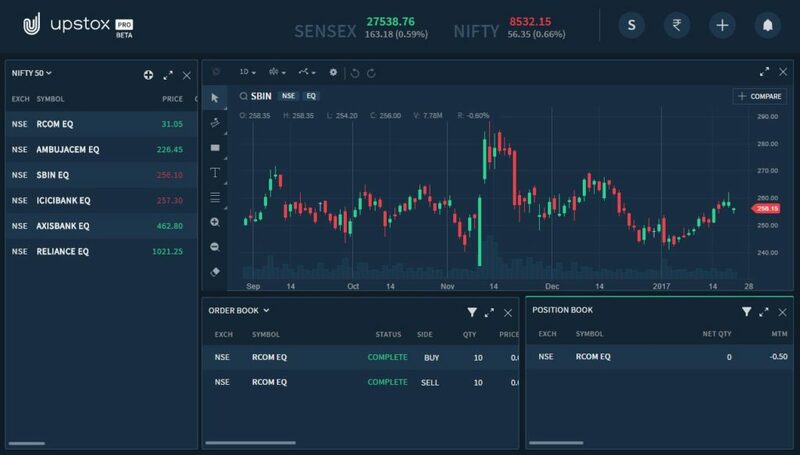 The application comes with various advanced features such as API integration with third-party applications, algo-trading, technical indicators, charts, heat maps etc. 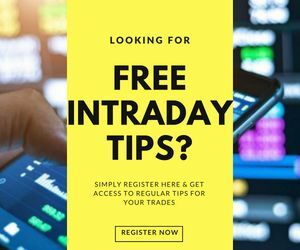 All these features help you to perform your trading with in-depth analysis and market understanding. Furthermore, Upstox Pro Web uses HTML5, thereby, providing a much interactive User interface and trading experience. However, there are a few fallouts as well. 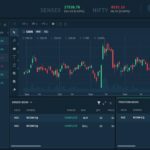 Let’s discuss all that in this detailed review so that you can figure out whether this trading platform is good enough for you. The web app is pretty lightweight, filled in with decent features and is regularly updated. Upstox allows you to place brokerage free trades for Equity delivery and charges ₹20 for other segments such as Futures, Commodity, Currency etc. Having said that, the app does not provide a provision to invest in the mutual funds’ segment. That can be a turnoff for a few investor users. The application uses socket technology that allows access to real-time market data at a much faster rate. Charting tools with 107 indicators and 10 drawing tools (such as Fibonacci, pitchfork etc) allow users to perform rich technical analysis with ease, convenience. Duration of a candlestick chart, for example, can be set from 1 minute to 1 month. 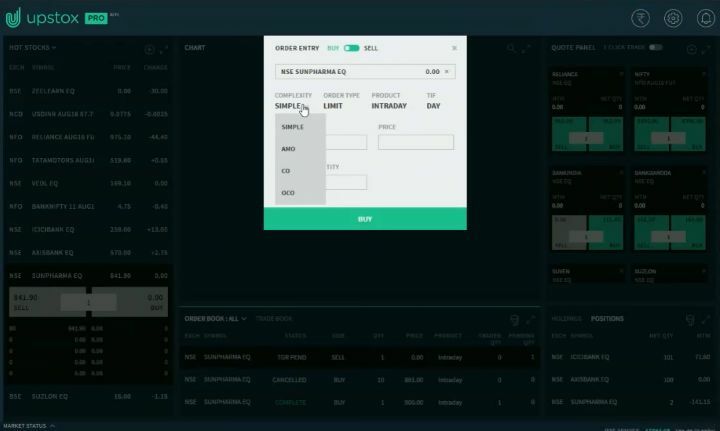 The application also allows you to place orders directly from the chart without going through any other screen. To save time even further, the application offers drag and drop facility with which users can drag a particular scrip and drop onto the charting screen, thus, letting the system display the scrip in form of a chart instantly. You can directly place trades from the chart feature with a single click. Users are required to right click and select whether they are looking to buy or sell that particular stock. Customizable layouts, alerts and themes as per user’s preferences. This basically implies that you can have 5 different windows opened up at the same time with multiple layouts, themes, features, charts etc getting accessed. Users can also access different features through keyboard shortcut keys, thus, saving time during opportunities. 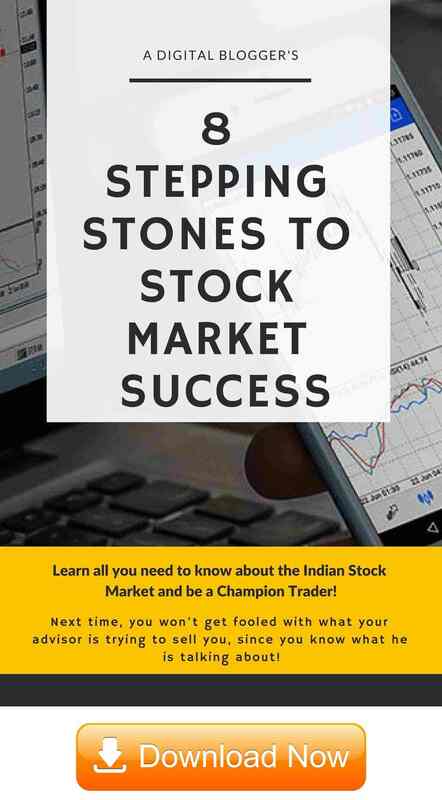 Access historical data for as back as last 10 years, which helps a lot in fundamental analysis of stocks. The broker has done a partnership with a stock scanner business named ‘Dartstock’ that allows free scanning of stocks running through a large number of data points. The app has been around for a while since its launch, however, the number of features offered are relatively limited in number. This becomes a concern, especially for intermediate to advanced level traders. Relatively tough to use, especially for beginners. But by no means provides a sub-optimal user experience. The market is getting tough and most of the stockbroking firms are putting in their efforts to bring the best trading solutions to clients. Upstox does not allow to invest in Mutual funds so you won’t be able to invest in MFs through the software. The web app sees an update every 2-3 weeks which is an excellent update frequency cycle. This allows users to access new features and get rid of existing bugs or issues in the application. Multiple types of order types such as Limit Order, Market Order, Stop Loss Order, Cover Order, Bracket Order etc are allowed to be executed through Upstox Pro Web. You can place AMO or After Market Orders between 4 am and 9 am and then between 6.30 pm and 12 am. You may choose to place AMO orders during these timelines. The order execution happens in the next trading session at 9.15 am sharp! Users can shuffle across different widgets displayed on the screen as per their preferences. For instance, if you want the market watch to be displayed to the right part of the screen, you can do that in Upstox Pro web. You can even have a check at multiple watch lists at the same time, all customizable. Upstox Pro web is known for its performance and thus, provides a smooth user experience to users. The feature also offers 100 studies for users to create their own technical and fundamental strategies. Furthermore, you can even compare multiple scrips to gauge the performance of stocks at the same time. Users can trade across exchanges segments including Equity, Currency or Commodities. In the end, this needs to be understood that discount brokers such as Upstox keep high focus when it comes to technology. This point gets reflected in the kind of trading solutions it offers. Upstox Pro is one of such positive attempts and till now, the application has done a reasonable job for what it is developed for. Having said that, the concerns mentioned in the above section cannot be taken lightly either. Thus, if you are looking to choose Upstox, you may need to wait a bit for the applications to get much advanced than what these really are at the current level. But, it is pretty much definite that it will get there on time! 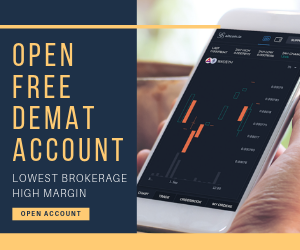 Interested to open a demat account? Enter Your Details here to get a call back now. Thanks for this article i am thinking to start investing from this Upstocks mobile application. Can you link any beginner guide for me? Upstox is India’s best online discount broker today.. better than zerodha who doesnot allow OTM options trading. I have opened account using Upstoxonline.com website in 5 minutes flat by uploading my documents online. What more, I’m also earning Rs 300 per account which I refer and 10% commission lifetime.